Wanna know one of our favorite easy freezer meals? BREAKFAST BURRITOS! Yep, they are actually really easy, and make A TON! and PERFECT for make ahead meals for when baby arrives! I get 10 of them knocked out in one night, and easy thing is I pop the remaining 8 in the freezer for an easy meal another day! So, so, easy, so tasty and not filled with tons of preservatives like the ones you can get at the store. Here is my personal recipe to try out! Use what you like though. I stick with bell peppers, green chilis, onion, turkey bacon, eggs, hash browns, and cheese on large flour tortillas. It's not gluten free, I have tried the brown rice tortillas and they don't work well with this. 1 flour tortilla is ok per 21 Day fix! ~sauté bell peppers and yellow onion to soften. ~Add whisked eggs to veggies and can of green chilis and make into scrambled eggs. ~Cook bacon to desired crispiness and let drain on a paper towel. Once cooled crumble into small pieces. ~Add 1 tablespoon to a medium hot pan. Add frozen or fresh hash browns and brown up. Stirring frequently so they don't burn. ~once eggs are all cooked, bacon is cooled off and crumbled, an hash browns have finished cooking. It is time to assemble. ~Lay a flour tortilla down, top with a spoonful of eggs and veggies, then add the bacon, then spoon some of the hash browns. Top with a sprinkle of cheese and fold up as a burrito. 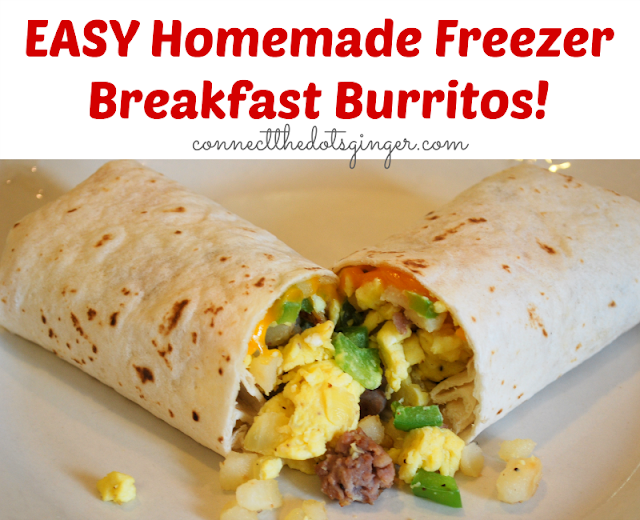 ~Wrap in tin foil to serve or to freeze in freezer for later! Pre-heat oven to 400 and add burrito still in tin foil. Cook for 15-20 minutes turning at least once. Making sure the middle is warmed. or microwave without the tin foil for 2-3 minutes. (oven is way better though as it makes the tortilla crisp up!) I still use this on my 21 Day Fix nutrition. I think it is close enough to being approved. Use turkey bacon instead of sausage though. More veggies the better!